JWV In the Community Archives - Jewish War Veterans of the U.S.A.
Cub Scout Pack 210 proudly display their new Scout Pack charter. The charter is the first Shomer Shabbat/Kosher Cub Scout Family Pack in the nation. 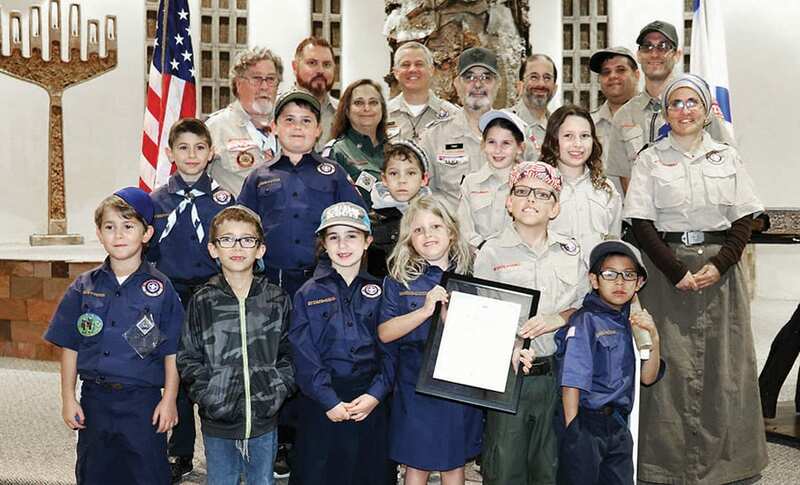 December 2, 2018 was a very special day for the Jewish Community in Phoenix as the first Shomer Shabbat / Kosher Cub Scout Family Pack in the nation was chartered. A Family Pack is a new concept in scouting where both boys and girls are in the same pack and can earn the same awards, however in our pack they are in separate dens. The Ceremony was held at Beth El Congregation in Phoenix. Many scouting executives of the Grand Canyon Council of the Scouts of America were in attendance. Fernando Gomez, executive with the Central District Scouts of America, presented Anita Gettleson, Chair of the Grand Canyon Council Jewish Committee on Scouting, with an award for founding the new Cub Pack. After that, Shari Judah, the Cub Pack advancement chair, presented the Bobcat Award to several of the Scouts. Andy Price, the new scout executive for the Grand canyon Council of Phoenix, presented Major Steven Troy of JWV Post 210 and the chartered organization representative of the Pack with the official charter. After the ceremony the Scout project for the night was to make Menorahs. Post 243 at the Children’s Hospital. David, who spent a year in Madrid studying Spanish before his Army service, speaks with humor and nostalgia about his introduction to the military in 1967. After being commissioned, he was posted to the Miami field office of the 111th Military Intelligence Group as an operations officer. Upon leaving the Army, David stayed in Miami and graduated in law to add to his undergraduate degree in Spanish from Franklin and Marshall College in Lancaster, Pennsylvania. Thus, his involvement with the Jewish War Veterans also began. He joined Coral Gables post 243, rising to become post commander, then National Judge Advocate followed by in 2005 by the top job of National Commander. JWV’s latest battle felt particularly painful on an emotional level. Israel’s deputy foreign minister, Tzipi Hotovely, claimed American Jews never send their children to fight for their country. Her comments in November last year drew withering criticism in the United States. And a hasty apology left out Jewish Americans who served in Iraq and Afghanistan, further inflaming the situation. David was one of the past JWV national commanders to sign a letter to Ron Dermer, Israeli ambassador to the U.S. demanding Ms Hotovely apologize directly to Jewish veterans of all conflicts. This she did. That home truth was illustrated following David’s powerful words at the Friday night Shabbat service before Memorial Day this year, which was dedicated to veterans. Several members of Scottsdale Post 210 spent many hours on Friday November 9 and Sunday November 11, in front of 5 FRY’S food stores collecting for Veterans organizations that they support, to include The Arizona State Veterans Home in Phoenix, Packages from Home, the National Cemetery in Phoenix and others. It was a successful weekend of the generosity from FRY’S patrons. Some of the Post members that collected were Commander Rochel Hayman, Michael & Ahuva Chambers, Steven Troy, Juli Altman & David Woodland, Jonathan Sorrell & Millie Rogowin. See pictures 1,2,3. Another venture of Scottsdale Post 210 of the Jewish War Veterans was to Charter Cub Scout Pack 210. On Sunday night November 12, members of the Jewish Cub Scout Pack 210 attended an American Flag Retirement Ceremony at North Mountain Park, Yavapai Ramada. In addition to many Cub Scouts and older Scouts there were representatives from both The Grand Canyon Council and the Central District of the Scouts of America. After several speeches Phoenix Councilwoman Debra Stark presented the first folded flags to be retired to the Scouts from Pack 210. Troop 41 and Troop 329 then continued to retire more than 100 flags. During the event, a bugler played. Only cloth flags were retired. According to the U.S. Flag Code: The flag, when it is in such condition that it is no longer a fitting emblem for display, should be destroyed in a dignified way, preferably by burning. The Cub Scouts that attended learned the proper way to fold the flag and to retire it. This was a valuable ceremony that not many get to observe. 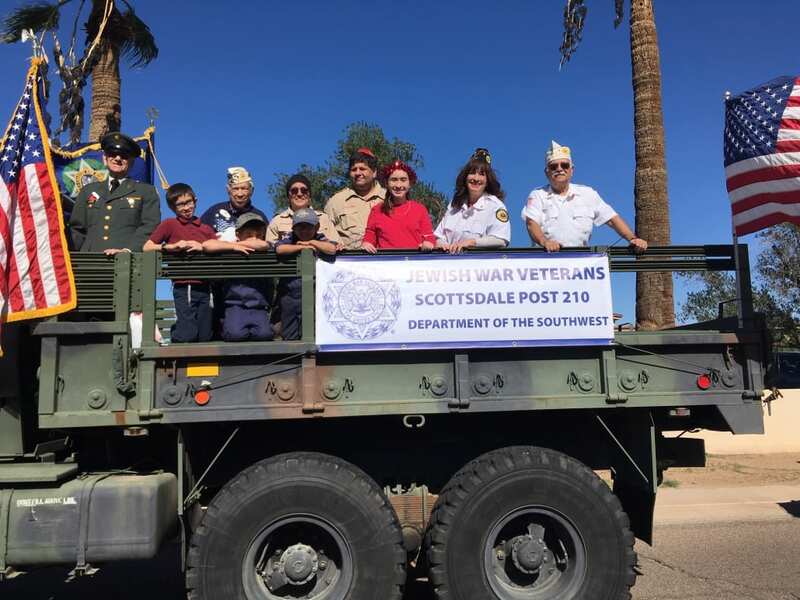 The last event, of the weekend, that Scottsdale Post 210 and Cub Scout Pack 210 participated in was in the Phoenix Veterans Day Parade in downtown Phoenix on November 12th. The parade this year had Loretta Swit as its Celebrity Grand Marshal along with Eight Veteran Grand Marshals, representing each era of military service from World War II to present day. The Post and pack were fortunate to partner with the Arizona Military Vehicle Collectors Club and ride in two of their vehicles. A WWII Jeep and a 5-ton troop carrier with no top. The parade route took us through the streets crowded with cheering people. The Scouts and veterans waved at all and had a ride to remember. See pictures 8, 9, 10. Jewish War Veterans of the USA (JWV) is the voice of the Jewish serviceperson and friend to all veterans. Formed in New York in 1896 after the American Civil War, the Jewish veteran group was known as the Hebrew Union Veterans Association. The union fought anti-Semitism in the Armed Forces and the general public. Seeking to prove that Jews do proudly serve and fight in the US Armed Forces, the union evolved with each war, eventually taking the name we know today – JWV. With over 120 years of service, JWV is the oldest, continuously operating Veteran Service Organization in the country. Sheila doing the pledge with Allentown Jewish Day School. Post Commander Sheila Berg of Lehigh Valley Post 239 is no stranger to the JWV and its community outreach programs. Sheila serves not just as a Project Maggid speaker, but also as JWV’s Chairwoman of the Women in the Military Committee and has previously served as an NEC for the Department of Pennsylvania. Recently, Sheila was a participant in a Veterans Day ceremony at the Allentown Jewish Day School, where she shared her story with the students. Retired Senior Master Sergeant Sheila Berg, originally from Westbury, Long Island, joined the United States Air Force reserves in 1980 because she wanted to serve our country and sought a challenge. For 14 years, she served as a jet-engine mechanic in and around Dover Air Force Base. She also deployed to Iraq during the Gulf War. After 14 years as a jet engine mechanic, Berg became 1st Non-Commissioned Officer in Charge (NCOIC) of Family Readiness for the Reserves at Dover and was called up to Active Duty for 3 years. In 2009, SMSG (ret) Sheila Berg decided to hang up her hat from the military, and she decided to give her experience and expertise to JWV and the Jewish community. Sheila with the 7th Grade group. 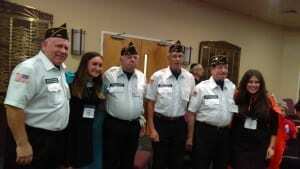 During this Veterans Day, she first joined the Middle School students of Allentown Jewish Day School for a flag raising ceremony, and following that, she gave a talk to the students at an assembly. 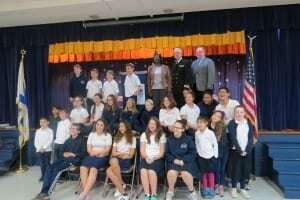 Several guests, high ranking military personnel and representatives joined her for this talk, including Rabbi (Lieutenant Commander) Seth Phillips, State Representative Michael Schlossberg, Naval Commander Sean Boyle, Captain and Jewish Day School (JDS) parent Kristen Johnson, and JDS teacher and IDF veteran Merav Wirthiem. “It was an educational and interesting assembly, with a great deal of wisdom imparted to the students,” said Sheila. The assembly concluded with Rabbi Lieutenant Commander (Ret.) Seth Phillips remarking that “people in uniform are the most peace loving of all, because we know the cost. We don’t long for a fight. We wish we all could live in Shalom”. Speakers, like Sheila, go out into Jewish communities through JWV’s Project Maggid storyteller program. To date. it has proven itself to be a very popular program with over 100 speakers telling stories of Jewish veterans in 2018. Any veteran interested in being a Project Maggid speaker is invited to reach out to JWV National Headquarters and learn how you can become one.